Faux leather is a practical and stylish alternative to the real thing. Most faux leather is made from vinyl and closely matches the look and feel of real leather at only a fraction of the cost. Unfortunately, faux leather also ages like its natural counterpart and may begin to show signs of wear after several years of use. It is normal for faux leather to crack over time, and this can cause furniture to become a major eyesore. Luckily, you can prolong the life of your faux leather furniture with a vinyl repair kit. 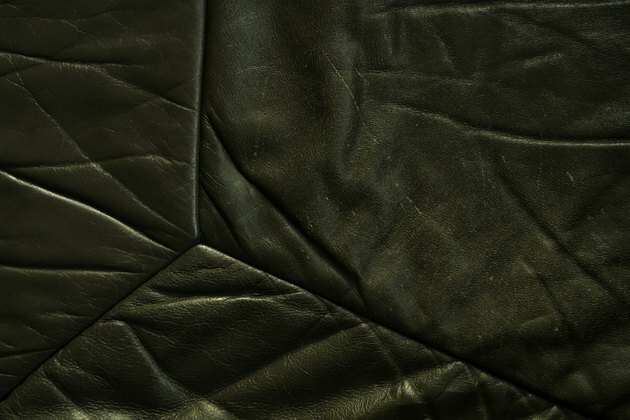 Restore cracks in faux leather to make it look just like the real thing. Trim away any excess fibers from the edges of the crack with a pair of scissors. Cut as close to the surface as you can without further damaging the faux leather. This will minimize the appearance of the crack and make for a seamless repair. Wash the cracked area with warm, soapy water. Gently scrub the area with a clean rag to remove any dirt and debris from the surface of the furniture. Blot the area dry. Wipe the area with a soft cloth dipped in denatured alcohol to remove any remaining soap residue. Rinse with warm water and blot dry with a clean rag. Choose a vinyl repair kit that matches the exact shade of your leather furniture and comes with a filler compound for scratches. Put on a pair of gloves then mix the filler compound, according to the instructions provided in the kit. Apply the filler compound to the scratch with a Popsicle stick then allow it to dry for at least 10 minutes. Rub the area gently with fine-grit sandpaper to work the compound into the crack and match the look of the faux leather grain. Rub a small amount of filler compound over the entire area with a soft cloth. This will blend the coloring of the repaired area with the rest of the furniture to create a seamless repair. Jessica Leigh is a professional writer with works published for "The Houston Chronicle" and various websites. In addition to pursuing a degree in legal studies she has years of experience in the financial industry as a tax preparer. How Do I Remove Scratches and Scuff Marks From Vinyl Upholstery?